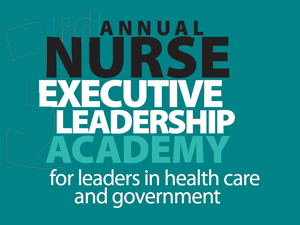 Building on themes of health system transformation, values-based leadership, implementation science and collaboration, the 7th Annual Nurse Executive Leadership Academy offers an energizing knowledge exchange forum for nurse executives from all sectors. Participants will gain new knowledge and a fresh perspective to support and enhance their leadership, governance, strategy, and practice roles. The program will feature expert faculty from policy, practice, academia and research, providing up-to-date insights for bolstering knowledge and generating solution among executive nurse leaders. Meet other nurse executives, engage in dynamic dialogue and discuss current and emerging issues across the sectors. Confirmed speakers include Ministry of Health & Long-Term Care senior officials including Bob Bell, deputy minister; Michelle Acorn, Ontario's new provincial chief nursing officer; Denise Cole, assistant deputy minister; and our Wednesday keynote speaker, Peter Buerhaus, an international authority on the economics of nursing. "I always look forward to RNAO's Nurse Executive Leadership Academy – it's a great opportunity to network, celebrate success and gain insights into the trends that are shaping our health system and profession." "I deepened my knowledge of what it means to be a nursing executive at this conference and also became acutely aware of the importance of joining my nursing colleagues in advocacy efforts to contribute to the strong nursing voice in Ontario. I would highly recommend this workshop to my colleagues and hope to attend again in the future." "NELA helped me realize how impactful RNs can be in transforming our Health Care System through all sectors. NELA has helped me to grow and aspire to contribute as a Nurse, Educator, Director, Leader or Researcher." "Perhaps my biggest growth from NELA came from the networking with my new nursing peers. I left so energized and refreshed from being engaged with such a fantastic group. I learned about the struggles and successes in so many nursing disciplines simply by sitting with someone new at lunch or working with someone new through some of the interactive sessions." "NELA is one of the most energizing and relevant professional development events for nursing leaders in today's changing health system... a must attend!" Cancellations will be accepted up and including May 11, 2018 at 4 p.m. less an administration fee of $95. Attendee substitutions after this date are acceptable. RNAO reserves the right to cancel or reschedule this event. RNAO cannot compensate you for the cost of unusable travel expenses or any other expenses resulting from cancellation. All fees for RNAO member and non-member pricing include HST. If you are not registered for NELA and would like to purchase tickets to the Wednesday, June 13th dinner and round table discussion with Dr. Peter Buerhaus then you may purchase tickets here: https://rnao.ca/events/round-table-discussion-dr-peter-buerhaus There is no fee to attend the dinner and discussion if you are registered for the full event. For more information, please contact Melissa Aziz.